Today's article focuses on the architecture of the Newark Public Library. The Newark Public Library was 110 years old on May 15, 1997. When Robert Treat and the original settlers arrived here in May 1666, they brought books with them. Throughout the subsequent years, books, information and knowledge have been the stock in trade in the public library. The building which housed its immediate predecessor, the old Newark Library Association, was used for a brief time as the home of the Newark Public Library. Construction of the present building began in 1899, taken from plans designed by the Philadelphia firm of Rankin and Kellogg. John Hall Rankin, who devoted several years of his professional life to the construction of the building, was formerly associated with McKim, Mead and White, the firm that had recently designed the Boston Public Library. A close look at the Boston building clearly reveals a similarity between the two buildings. Both libraries own their architectural heritage to a Florentine renaissance palace. 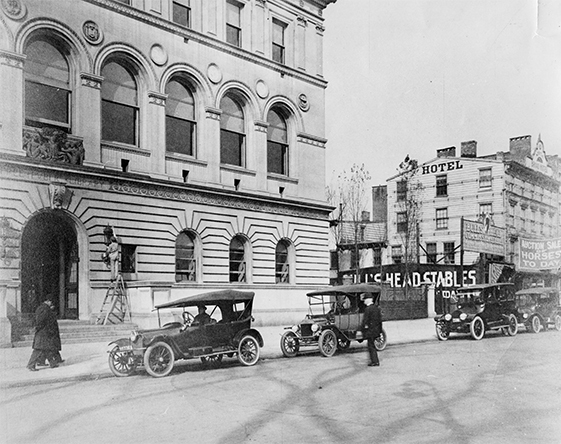 When the present home of the Newark Public Library was opened in 1901, it was truly a showplace for the city. Said John Cotton Dana, who founded the library and the Newark Museum, 'Whenever an American community builds such a grand building, it has indeed become a great American city.' Within the structure's Renaissance walls, rearrangements, reorganizations and revitalization have helped to keep the old library young, preparing it for great challenges into the next century. 'Wisdom Instructing the Children of Men' by John Flanagan (1865-1942), commissioned in 1903 and installed in 1909, is the high bronze relief over the library's front door. John Flanagan was a native Newarker who lived on Newark Street and attended Cooper Union and the Art Students League of New York City. He studied with Augustus St. Gaudens, lived in Paris, and returned to the United States in 1903. Some of Flanagan's better known works include the statue of Joseph Henry in Albany, a head of Augustus St. Gaudens, and a clock in the Library of Congress. He is best known as the designer of the George Washington quarter. 'The Fountain of Knowledge' by Ives Gammell, installed in 1929 and refurbished in 1989, is a three-panel monumental mural on the east wall of the library's second-floor gallery. 'The Fountain of Knowledge' is a large triptych dominated by Apollo, surrounded by Nine Muses. According to classical Greek mythology, they are the daughters of Zeus and Mnemosyne and include Calliope for epic poetry and eloquence; Euterpe, music or lyric poetry; Erato, poetry of love; Polyhymnia, oratory or sacred poetry; Clio, history; Melpomene, tragedy; Thalia, comedy; Terpsichore, choral song and dance, and Urania, astronomy. According to legend, Apollo is the muses' leader. They are portrayed in the mural as taking knowledge to the four corners of the world. A modern addition to this near-classical panorama was a Greek-robed John Cotton Dana, Newark's famed library director on the far left. At the panel's unveiling the famous librarian's death was still a recent memory. During the library's 1950 renovation, the art work was carefully hidden from view. In 1989, the wraps were removed and the mural was cleaned, and again placed before the public — an excellent example of period art work in a great public building. The printers' marks in the library's Centennial Hall are to books what a hallmark is to the silversmith. They show that a book or publication has been printed by a first-rate craftsman who was outstanding in his field, and that the publication would not only be accurate, but also beautiful. The great printers' embossments are located in the frieze of Centennial Hall. The two most important spaces were reserved for William Caxton, over the south fireplace, and William Morris, over the north counterpart. Caxton was an early 15th century English printer at Westminster. Morris was the great mid-19th century Kelmscott Press owner and hand-printing revivalist. Other print colleagues include Johann Fust and Peter Schoeffer, Germany's earliest printers, whose marks incorporate their two shields. St. Albans is an unknown English printer bearing the name of the town of his origin. His seal included the cross of St. Andrews inside a circle. Actually, St. Albans is England's oldest printer, preceding even William Caxton by almost a decade. The print mark of Johannes Treschel included a double cross in a circle. He began work in Germany, but later moved to Lyons, where he became one of France's greatest printers. Fifteenth-century Strasburg printer Martin Schott used the cabbage as his seal, while Wynkyn de Worde associated his name with representations of the sun, stars, and foliage. Thomas Anshelm, Alsatian printer, produced books between 1488 and 1522. His mark included his initials, TA, and a cross with the Hebrew letter for Jehovah. Erhard Oglin used the fleur-de-lis on top of a globe. He was active between 1488 and 1522. Valentin Schumann of 16th century Leipzig used four initials for identification. Aldus Manutius of Venice, whose career began in 1494, was the first European printer to use italics in a book. John Siberch incorporated his initials and the symbol of Hermes. He was Cambridge University's first printer in 1521. Robert Copland, 'at the sign of the Rose Garland in Fleet Street,' always incorporated the English rose in his signature. Hugh Singleton, the bad boy of the printers, narrowly escaped having his hands chopped off for publishing an offensive pamphlet about the Queen. Christopher Plantin, a Flemish master, used the sign of a twig and a tree 'just as the twig is bent, the tree's inclined.' William Jaggard, printer of Shakespeare's plays, used a curious symbol including a snake coiled around the wrist of a hand emerging from a cloud, a snake biting its own tail, and the motto 'Prudence.' Thomas Creede, who began working in 1588, used a mark including a woman being tapped on the back by a rod. The famous Dutch Elzevir family was represented by a lone individual with the motto 'Non solus' (not alone). In general, these marks represent the greatest early printers and printing. Some of their works are found in the library's rare book and Jenkinson collections. Today, if we were to decorate a great modern hall in the era of technology, we might include a view of a photocopy machine, a video tape recorder, a computer, a laser, or a robot. When the library was built, the printers' marks were the symbols of a great society interested in its literature, history and culture.